Guest Post: 8 Reasons Youth Workers Should Watch "Modern Family"
I want to introduce to you my friend and co-worker Derian Julihn. After years of working together as Youth Workers Derian and I often reach the same conclusions on things. And yet, we have completely different personality type and we are constantly learning from one another. Since I don't have TV service Derian will often keep me up to date on the latest media. This is true of the show modern family. He proclaimed that every youth worker should watch the show. I asked him why and this is his answer. On a side note, Derian keeps a blog as well and I would encourage you to check it out here. I am about to make a blanket statement… If you are a youthworker or youth pastor and are not watching ABC’s Modern Family you probably should clear your schedule for Wednesday nights at 8 pm. If that’s not an option you need to set your pvr or watch it online. So why do I think you should watch this show? Laughter: This show absolutely hilarious. If for no other reason than a good hearty laugh you will find yourself rewarded for watching an episode of Modern Family. Family Friendly: It can be hard to find shows on tv that aren’t violent, crude or sexual. While not necessarily traditional it is actually quite family friendly. Our Family Mandate: Closely related to the last point is this: most youthworkers and youth pastors know that their job is as much working with a youths family (parents and siblings) as the youth themselves. Learning to Love: You might see love in places you’ve never really understood before. Despite all the conflict and neurotic mess of this non-traditional family you’ll see how much they love each other. They might not understand each other or their choices but they are willing to fight for each other. Perhaps you too will begin to fall in love with them—foibles and all. Perhaps it might take you to a place of tolerance (I can disagree with you and love you without having to change you) you’ve never been before. That’s my pitch. I hope you enjoy Modern Family as much as I have. If you do find it worth your while may I also recommend you stick around and check out The Middle which follows Modern Family. Perhaps I’ll write a follow-up blog on why youthworkers should watch it but that’s for another day. I looked across the table and looked into the eyes of the young person as they recounted a story of unbelievable hurt and pain. The words spoken are too painful and too powerful to recount in a medium such as this. These are things that should never have happened. my eyes could see the youth that was robbed of this young person and how they were shriveling into an old soul. my heart screamed the loudest as it said "IINJUSTICE". my tears came. I could not stop them. I could not separate myself from the pain of this. Empathy was not enough and yet, what more could I offer. "I'm sorry for making you cry." Today is my birthday and I have a hard time celebrating when there are so many where their birthdays are, to them, not worth celebrating. Of course I'm glad their alive and I'm glad to sacrifice my special day to make their day somewhat better. If you want to make a difference along with me. Make my birthday an excuse to make a donation toward my work with young people. I need to raise an additional $29,000 in order to break even this year. Think of it as a gift to keep someone around these youth that cares enough to acknowledge that the world wouldn't be the same without them around. Plus it is a tax free birthday gift, how often does that happen? Sometimes it comes as a complete shock to parents that their teens are dealing with complex issues. The perception is that there is good communication, but the kids feel like they can't say what is really on their mind. For this reason I ask youth to write anonymous letters to parents with things that they would like to say. So it could be that your child wants to write a similar letter to this one. How would you respond? the middle of last year. It was an absolutely brutal time. Where were you? Do you even know why I would start? Take a glimpse at my life. Did you know I had no friends? Did you know I have no support here at home? Did you realize I had nothing? You and I constantly fought, and then you hit me with the possibility of moving away and that hung over me. Then there were the guys. One I trusted let me down in the worst possible way and the jerk I was dating hurt me more than loved me. I could go on and on. Did you know that many of these things are still with me today? I’ve found a better way to cope. I wouldn’t say I’m TONS happier, but I am a bit. My heart is still bruised, and I’m still broken and bleeding. People I trust still find the need to kick me when I’m down, but whenever I’m upset I just remember that each day I go without adding another scar to my body, is a day closer to conquering this addiction. It hasn’t been as hard as I thought it would be. It’s been harder, but before I hit rock bottom, I never realized how deep in it I actually was. I want to tell you about an amazing resource for helping young people re-connect with their families. Maybe your family life isn't in the dire straits as some of the stories I've shared on previous blog entries, but you don't have to reside in complete dysfunction to need help connecting with the people living in your home. The program is called Youth and Parents Adventure Retreats (www.adventureretreats.ca). One of the greatest things about this is that you can design the type of adventure you want to go on together (hikes, boating, rock climbing, you name it) and the team will help construct the weekend for you. Also you can interact with the youth workers about what topic you are hoping to address and they will help you with resources if you need them, or simply just show you a quiet place you can talk. In my opinion it is definitely worth checking out. Make sure to watch the promo video for adventure retreats now. The ancient Hebrews were borderline obsessed with tracking family historic data. 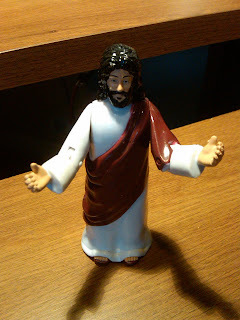 These end up as long dry lists of names in our bibles that most of us skip over, however these lists can help us realize that the image we have a plastic Jesus that can't relate to our messed up family life can be put into a more realistic light. Abraham - liked to tell people his wife was his sister. On and on it goes into the accounts of the kings who did some good, but mostly bad. A sultry list of characters to be certain. The point is that even Jesus' own half brothers thought he was baked. His step father isn't recorded as being around after he was 12 so it's likely that he died when Jesus was still young. The people from his small town even tried to literally push him off a cliff. The friends that he did make abandoned him in his darkest hour and even denied that they knew him. Plus his dying words were calling out to God asking why he had forsaken him. If anyone knew what it was like to feel alone without the bonds of family, it was Jesus. If he can really forgive people for abandoning him and he indeed is God. Maybe he isn't so plastic after all. Even if you are angry at the church I urge you to consider Jesus. he could end up being the family you are missing. As a youth worker it is sometimes hard to see the big picture. We think that we have things figured out, that we have some sort of x-ray vision into the lives of the young people that we are connected to. There may be times we are tempted, after hearing tales of difficulties, to tell young people that we know "exactly" how they feel. When their lives fall apart were may be tempted to say "I told you so". We need to remember that we don't always have a full picture of what is going on or what is going to happen. Today one of my friends, Danielle Christopher, gives us a glimpse in the world of what it is like to face a world of uncertainty. Danielle, who is now a young mom you may pass in the isle at walmart once was a young person facing a world of hurt. Her story is inspiring to me as I can hope that the young troubled students will turn out to be so "normal." Her story also reminds me that I can never have the whole picture in my head and that there are many times I should just shut my mouth and just listen more. “Mommy, read it again, please.” My toddler pushes the fairytale book open again. Her eyes stare at me with a puzzled look. I wipe my eyes quickly nodding and take hold of the Cinderella book for the second time. I tell the story and get to the point where Cinderella is crying in the garden and her fairy godmother appears. I feel the tears bubble in my throat again. It has been a month since I said good-bye to my fairy godmother. Ever since I can remember I thought that the fairy godmother in this tale was based on my own godmother, Judy. They both looked the same and taught unconditional love. When my mom died, Judy was my go-to person to talk about anything or to just listen. As my dad’s anger grew grieving for my mom, he focused on me as a target of his abuse. Judy faded away when she moved towns away. My dad’s abuse isolated me. I was afraid to tell anyone what was happening at home. From the time I was eleven until I was almost sixteen, I lived in the pain believing that I deserved it. After one extreme blow-up with my dad and stepmother, they took me to a counselor. They were concerned that I was depressed, my grades dropped and I had no friends. After two months of weekly counseling, I turned sixteen. It was an un-happy birthday. There was an extreme fight. My stepmom took off. Dad slammed the door to his room after telling me my birthday party was cancelled (a half an hour before it was due to start.) I didn’t cancel it and fake-smiled my way through the room of family and the few neighborhood friends that came. The next day I had my regular appointment with the counselor. After he asked me how life was going, I bawled my eyes as I poured out my heart. After I cleaned my face, he looked at me and informed me that since I was sixteen, legally I did not have to live at home as long as I had a safe place to go. After dinner I got a call from my godmother, Judy, wishing me a happy belated birthday. I felt like Cinderella in that garden and told her everything. Judy told me that I could come live with her for two weeks. After she had a long talk with my dad, I left the next day. After the two weeks, I entered the foster care system because she could not afford to keep caring for me. There was no way I was going back to my dad’s house. Due to the process, I had to temporarily live in group homes and smaller foster homes. Judy became my foster mother to help receive money to raise me. When I left her house to get married, we kept in touch. Our ‘adopted’ family kept the Sunday night dinner tradition for several years, rotating hosting duties. The day our daughter was born, a fairy godmother became a fairy grandmother. When Judy was disabled with a bad hip, the relationship between her and my daughter deepened. I got pregnant a second time and was unable to help Judy as much as I wanted to do. Judy died suddenly when my daughters were 2 ½ years old and 5 months. All the pain of losing my mom, my grandmothers and now her, came back tenfold. My daughters lost the grandma they knew. I lost the mother I knew all my life. I break out of the memories to my daughter staring at me again waiting for the end of the story. Hugging and kissing her tight, I am thankful I had one parent figure for as long as I did who loved me no matter what. Because of that gift, it is how I parent and love my miracle daughters every day. Do you have a special person? If not-all you have to do is ask. They are there. I appreciate Danielle sharing her story and her writing with us here on (Pro)YouthWorker.com. Danielle writes for many websites and is a published author. I recommend reading her blog here at http://justdworld.com. Thanks to my guest blogger Morgan. She is an amazing writer and has a lot of insight into the world around her. I hope you enjoy her post. Family is a funny thing to try and describe in words considering the unique variety that exist in society today. The dictionary defines a family as, “a social unit living together,” or “a group where the adults protect the offspring.” To me the dictionary is missing a lot of the dynamics of a family. The fifties gave us the picture perfect family, a mother, father and the two little children playing in the picket fenced yard. I don’t know a single family with a picket fence nowadays though so where does that leave us? The unfortunate reality of the 21st century is that the divorce rate is nearly higher than the success rate of marriage. Broken homes and families are everywhere, but do you need a successful marriage to have a successful family? Do you even need a marriage to have a family? The traditional family has the married parents and their children, but my family consists of my two best friends, my dad, my step-mum, my nana, my sister, my step-brother and a friend’s parent. An unlikely mix up of the most influential people in my life have become the support system I lean on when things are impossible to handle and they are also the people who celebrate the triumphs and joys of life with me. I look at my family and see hope. I don’t see a broken jumble of misfits, I see everything I will ever need. A family doesn’t have to live together. A family doesn’t have to share blood. Your family is the group of people you trust with your soul, the people who never leave you alone and the people who make the sunrise beautiful and all those other corny simplicities worth while. A family is whoever you hold in your heart, alive, dead, near, far, related or not. A family is love, simple and pure. I would love it if you could sit with me and listen young people tell me about their family lives. There are things that are so disheartening about their homes. Unfortunately if I brought hundreds of people with me to my meetings with them, they may feel a little intimated. The second best option would be to write out the stories as I hear them, but we can't write about people's personal family difficulties without permission from ALL family members and that would be unprofessional and unethical. So here is where this video came in - where I "interview" a fictional young person that shares his story with you. I did make up this kid's story, but I didn't exaggerate the types of things that I hear. I'd love to hear your comments on how you might react to a kid like Keith. I was reading an article yesterday in the Wall Street Journal Blogs about the "advice gap." In this short blog post writer Jeffery Zaslow points out some example from his own life about the trend in intergenerational communication. This was run in parallel to his full article on the issue of wisdom of elders falling on deaf ears. Finding the article interesting I posted the link on my twitter and facebook account with the question, "Should teens listen to their elders?" I had some interesting discussion being reflected back to me and one of my friends ask me what my opinion on the matter was. As I was laying in bed last night in a failed attempt to sleep I was thinking over this topic and realized there was no way a comment field on my facebook would do for my response. As a youthworker a lot of my life is spent in the realm of noticing differences. After all the kids I work with never heard of my favorite TV shows or music from when I was a kid. Their expectation of instant communication means that they get mad if you don't respond to their text message within 14.2 seconds of receiving it. I remember in my day that you if you wanted to talk to someone that you had to call their house and wait for them to get home. Answering machines were just coming out and not everyone had one. In many ways I have tailored my life to approach young people on their level, but that doesn't mean that it's the right way of doing things. For instance, Zaslow, lists an example of trying to help his daughter make better use of punctuation and grammar in her letter to a businessman. In this he told his daughter to think she only had one explanation point she could use in her life and to use it well. When the 30 something business man responded using explanation points in 3/4 of his sentences that his daughter knew she had taken the wrong advice. However, just because a bad habit is common, doesn't it make it the right way of doing things. For instance, I have counseled a few young people this summer to refrain from having heated arguments over text message and to meet in person. And yet the idea is a foreign concept to them. Their friendships would have ended if I hadn't played the part of the mediator. That being said there are things that an older generation doesn't have a whole lot of input on, technology, social media, texting are all things that young people really are more knowledgeable. Young people get used to advising their elders on how to keep up with the technological edge, or just get annoyed at them as many people do of slow drivers on the freeway.It is a youth oriented society after all. At the same time another article I read yesterday, and I can't find the link of right now, mentioned that the older generation enjoy reading stories of youth failures precisely because they feel undervalued and feel that young people are over valued. Seeing the undervalued of the older many middle age people try their best to maintain their "edge". To be cool and to refuse to be adults, but rather just older peers. (Many people could describe me as a youth worker that way, I know). As such they don't like the titles of Mr. Smith or Mrs. Brown and want to be know as Brent or Amy. Many times youth do not take such people seriously on advice and they don't know why. My conclusion is that the culture is disconnected and shattered. For too long youth and elders have been separated that they don;t know how to communicate to each other or what to talk about if they do talk. Should teens listen to their elders? Well it seems to me that the first step it to get teens and older people alike to respect each other. We need to be reconnected at a human level. The older can help the world run more smoothly as many of their lives hard knocks can make a young person's life run more smooth and the young can respectfully guide the older in the way the world has been rewired.